The speech of Grigori Grabovoi at IV World Conference on Peace and Light, which takes place from August 24 to 26, 2018 in the Dominican Republic. 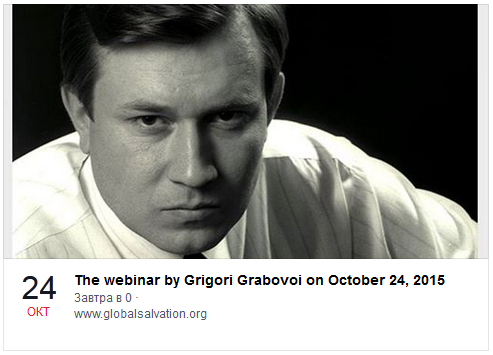 You are invited for the webinar by Grigori Grabovoi on October 24, 2015. Lecture will broadcast simultaneously in the following languages: Russian (original), Italian, English, Portuguese and Spanish. The Structuring of Consciousness according to my system of salvation is a science. … That is to say, you have to understand that we are talking about the structuring of Consciousness; therefore, you can use this structuring at the practical level where you want it. As a matter of principle, if we speak about the principle of information, then each object of information can be equal. This is one of the laws of information distributions. Then it turns out that you can, while being elsewhere, through the Consciousness control in order to avoid, let us say, a nuclear explosion, a disaster. Actually, the course of salvation, which I am delivering now, is based on the fact that each of you receives a rescue tool that can be reproduced by you personally. It is a set of technologies.